So I do this activity every year in January, because its usually quite popular, and super fun 😁. We will meet at Protected content and separate into as many cars as we have available! If not, some of us might need to get the train and then a lift from the train station in Traunkirchen, from those who have already arrived. Then, there is a short, fairly easy 50 minute walk in the snowy forest up to the Hochsteinalm Gasthaus, where we can enjoy some nice warming Austrian cuisine, and a maybe few drinks to make the way down a bit warmer 😂. 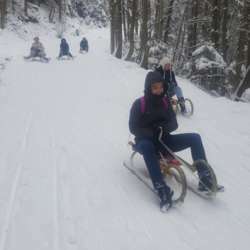 For the price of just 3€, you can then rent a sledge and slide your way back down to the bottom of the hill! It's very safe... no super high speeds here! Or ypu can walk back down and join us at the bottom a little later on. We should arrive back in Linz aroubd 4/5pm depending on how much time we spend in the Restaurant. So sign up below, and come join us! We will create a whattsapp group to iron out the fine details... so please message me with your number if you want to be included. Otherwise, I will post the final details on here the day before.